The average energy consumptions of most households in the U.S. usually range between $400 to $600. This is indeed a hefty amount of money. But you can readily diminish your household energy bill if you employ an effective energy-saving scheme in your household. The primary end-user of energy in most households is the heating system. Not far beyond in energy consumption, however, is the water heating system which uses almost 14% of the total energy consumed in most households. Hence, any holistic energy-saving scheme should greatly consider ways on how to lessen the energy consumption of the water heating system. It should also consider a shift from a tank-type to a tankless water heating system. As present, however, there are still millions of households that rely heavily on the tank-type water system. In the United States alone, there are around 27 million households that still use the old and outmoded tank-type water heaters. The tank-type water heaters are fraught with many disadvantages such as being only capable of limited supply of hot water; inordinate heat loss that leads to more energy consumption; bulkiness; can cause serious damage to the house if it leaks; and being not energy efficient. If you belong to these millions of households that still use the tank-type water heater, I think you should consider shifting to other types of water heaters. The best alternative to the old and clunky tank-type water heater is the tankless water heater. It is a by-product of technological advancements in various fields and offers great advantages over the use of the tank-type water heater. There are, however, many brands of tankless water heaters on the market today. Thus, it is easy to get confused as to which brand and model to choose. EcoSmart water heaters are known for their high energy efficiency. In fact, EcoSmart boasts of successfully achieving 99.8% energy rating for its products. 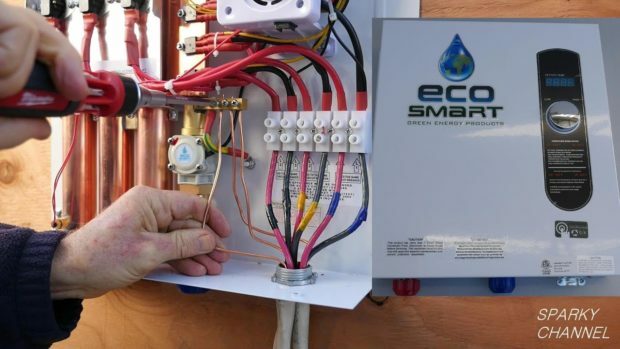 If you intend, therefore, to save on your water heating system’s energy consumption in the long run, then, the EcoSmart products are definitely a good choice. Another known advantage of EcoSmart water heater is its use of smart technology on its products. The designs of its products are sterling and incorporate the latest in sensor technology and smart technology. Moreover, it is user-friendly with its digital display of temperature. Its control panel is easy to tinker with, and after you’ve set it, the water heater functions on its own. Its Emerson Electric Heating Elements are also of great quality and design. They are either of stainless steel or copper. They also come with brass on their top. Hence, they last longer and show amazing durability. The EcoSmart water heaters are designed to last up to 25 years while the tank-type water heaters are only expected to last up to 10 to 12 years. Furthermore, all EcoSmart heaters are ETL Certified to UL 499. This means that EcoStart products passed and complied with the strict safety standards in North America. EcoSmart is also the only brand of heaters that has been certified via FIDE. Of course, the initial cost of installing the EcoSmart water heater may be more expensive than that of the tank-type water heaters. However, you can easily recoup this initial expense along the way as you save on your energy consumptions on a monthly basis. Installing EcoSmart water heaters is not that complicated as compared to gas-fired water heaters and tank-type water heaters. They are also designed for space saving and you can readily install it inside a closet, under the sink, in a crawl space, or in any place that is near the point-of-use. EcoSmart Water heaters are also eco-friendly. Many of EcoSmart popular tankless water heaters are electrically-operated. Thus, they are environmental-friendly and do not leave much footprints on the environment. If you want to save on your energy bills and don’t want to add to the degradation of the environment, opting for EcoSmart electric water heaters is surely a great idea. In fact, it is the wise decision that you must make.